Sweet tea, found in the refrigerator of all true southerners, must be sweetened ( meaning LOTS OF SUGAR) while the tea is still hot. It is sacrilegious to add sugar after the tea is poured over ice ! 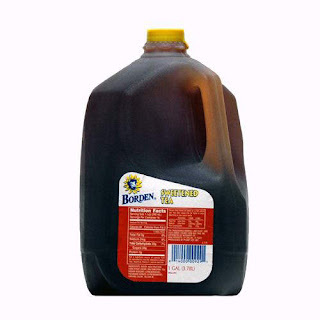 During my recent visit to Missouri, my cousin introduced me to “Ready to Drink” gallon jugs of pre-sweetened tea. This product, extremely popular in the South, tastes similar to homemade. Sweet tea is served year round in the South. It is assumed that if you ask for tea, you mean Sweet tea, and you only designate “unsweetened” if you don’t wish to have the traditional tea. We stopped for lunch at Poke Salad Annie’s….a delightful little restaurant in Humansville, Missouri, recommended by the desk clerk at our hotel in Bolivar. After being seated and ordering our iced tea (sweet tea for me, of course), I ask the server why they chose the name “Poke Salad Annie’s”. She told me the restaurant was named after a song. It’s true..there is a famous song Tony Joe White wrote in 1969. He is definitely a Southerner…using his first & middle name…Tony Joe….like Jim Bob or Troy Lee. He and Johnny Cash sang “Poke Salad Annie” as a duet, http://www.youtube.com/watch?v=k6diOn540Ws , and then Elvis Presley delivered his rendition in 1970…absolutely vintage Elvis..the way I remember him. http://www.youtube.com/watch?v=9d_LCGalZ1I&feature=related. Poke Salad Annie’s menu features regular items like Black Angus steaks and unusual specialties; frog legs & crawdads on Friday & Saturday nights. 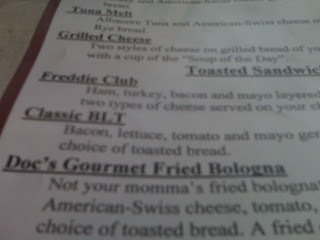 My favorite lunch time “claim to fame” is Doc’s Gourmet Fried Bologna, advertised as “Not your momma’s fried bologna”. All my life, I believed my Grandmother was the only one who ever fried bologna. I learned not to discuss eating fried bologna in California because people looked at me like I must be from another world, which of course, the South, especially the Ozarks, is a world unto itself. But then, here, at Poke Salad Annie’s, was fried bologna, in black and white, on a restaurant menu !! Poke Salad, though, was not on the menu. Poke Salad, is made from Pokeweed, www.pokesaladfestival.com/plant.htm , a weed of great distinction in the south. My mother told me about gathering “poke greens” in the spring with her grandmother. Turns out, poke weed is toxic and must be prepared only by those carefully trained to do so. My understanding is one gathers the young green leaves in the early spring, and then the leaves are boiled for 5 minutes, rinsed and re-boiled. Most southerners add a bit of bacon grease to make a tasty substitute for spinach or collard greens. Bacon grease, like Sweet tea, is a staple in all Southern kitchens . Poke Salad, (Polk Sallet, Poke Sallet, Poke Salat) is so revered in the south, that several towns celebrate this spring time green with a festival. The festivities are as distinct as the spelling of Poke Salad. In Gainesboro, Tennessee, not only do they choose a “Miss Poke Sallet“, but the highlight of the party is the Outhouse Race , www.gaineboro-jcchamber.com. In Blanchard, Louisiana (near Shreveport), the 35th annual Poke Salad Festival rates a parade and it’s own website: www.pokesaladfestival.com. Poke Salad recipes and folklore and Important Health Information can be found at http://www.rockytopgen.com/polksalad/index.html . I love being my mother’s daughter ! I was the only daughter for quite awhile, until both my brothers married. Now there are 3 daughters in our family. However, I am the daughter who had a “teenage” mom ! My mother is an incredible woman. She was born in rural Missouri, in the Ozarks. Her mother died when she was eight and her sister was six. She was raised on a farm by a single father, with a little help from the grandparents. She was poor, but never had a “poverty” or victim mentality. After graduating from high school early, she attended a teachers college. She was teaching school when she met my Dad. They married when she was eighteen and came to California. My father and grandparents decided to go into business in Washington and I was born a year later. When my youngest brother started Kindergarten, my mother went back to college to earn her teaching credential. She taught school for over 28 years. After we all left home, she obtained an administrative credential and a Masters Degree. One of her most endearing qualities is her patient steadfastness, she always accomplishes what she sets out to do ! Now in her eighties, she is still positive and active. She sees, speaks and believes the best about people, especially her family ! She is sensitive, insightful, full of grace and love ! Her cards and notes are always encouraging. She attends the graduations, plays, sports events and birthday parties of grandchildren and great-grandchildren. She has many friends at church, and keeps in touch with family members across the U.S. She enjoys traveling. We are leaving for Humansville, Missouri after Mother’s Day. 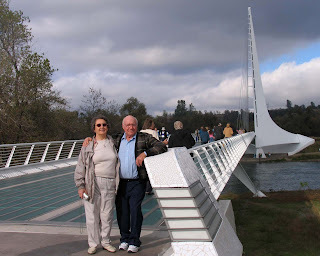 She still has hopes and dreams and persistently pursues her projects, and she is still married to my Dad ! (Sixty-three years in November) Not bad for a “teenage” Mom !! Yesterday, as I drove home from my tea room, the delightful aromas of all those teas were still lingering and taunting my senses. 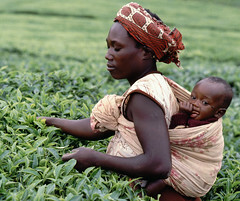 I literally began to crave one of my favorite teas. The wholesaler calls it Luponde, after the Tanzanian estate where it is grown. I call it Tanzania Treasure, a strong malty excellent tea ! Today, I raided the storehouse at the tea room and brought some home. While the tea steeped, I waited, anticipating the flavor and taste, the aroma, the bright coppery color. Longing for that first sip, the five minute “proper” brewing time, seemed like forever. I paced. I wondered if other addictions were as compelling. Are drug addicts or alcoholics as driven to get their “fix”? 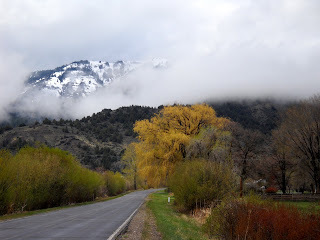 Last week, driving over Cedar Pass, which was still covered in snow, I wondered why I always feel like I am “coming home” as we descend into Surprise Valley. I thought it might be the people who inhabit this corner of the world. And yet, everywhere I have lived, life long connections have been established with fascinating people. 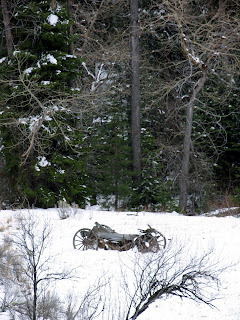 Perhaps it was the happy memories associated with the ranch and Surprise Valley. No… in remembering other places I have lived my mind is flooded with joyous recollections. Drinking my morning cup of tea, standing on our front porch and waving to the UPS man as he passed by, it dawned on me that there is a timelessness in this place and it is defined by County Road One. County Road One runs from Eagleville, to Cedarville, to Lake City and to Fort Bidwell. It is eighty miles long, each community approximately twenty miles apart. And the landscape doesn’t change. The ranches may be bought and sold, and sometimes the houses are painted and improved upon, but in 20 years not much really changes. 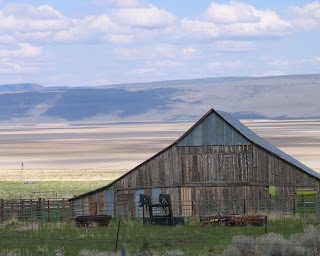 As you make your way through the valley, fields are still planted, irrigation lines are still standing, cows are still fed in the same pastures, and pregnant mares are still grouped together in their fields. 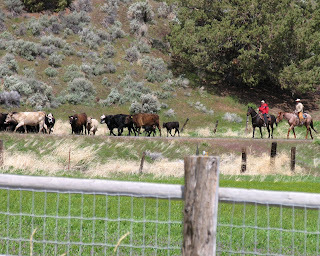 In the spring cattle are still moved down County Road One to their spring and summer feeding grounds and in the fall they are brought home on County Road One. The deer raid the hay barns in winter and graze in the fields in spring and summer and try to cross County Road One without encountering a vehicle. Surprise Valley doesn’t change. It feels like “home”, because unlike other places, it is just the way I left it ! Even though there may be a few little changes, nothing huge has disrupted this lovely place. There are no new roads, no new housing developments or new department stores being built. It is a quiet and peaceful journey home on County Road One……. May your journey home always be full of joy and peace !